5 wide-scoop spoons ideal for first steps in self-feeding. Chunky handles help little hands keep a firm grip. Ideal for little ones starting to feed themselves. Soft tips and sides, gentle on tender gums. Suitable for 7 months upwards. Dishwasher, microwave and steriliser safe. 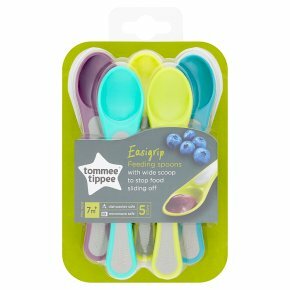 All Tommee Tippee spoons are BPA free.These easigrip, wide-scoop spoons are ideal for little ones ready to take the next step in starting to feed themselves. With big chunky handles that are easy for little hands to grip and a wide scoop that stops food from sliding off, they're perfect for junior diners. Please read and retain this important information for future reference. Cleaning Before first use, clean the product. Clean before each use. Always wash the product immediately after use. Wash in warm soapy water and rinse in clean water or use a dishwasher (top shelf only). Do not clean with solvents or harsh chemicals. Do not store with or allow to come into contact with solvents or harsh chemicals. Do not allow product to come into contact with oil based foods (e.g. oil/tomato bases sauces) as staining will occur. Not suitable for use in a conventional oven or a combination microwave oven with the grill feature switched on. Please read and retain this important information for your future reference.<br>For your child's safety and health<br>WARNING!<br>Always use this product with adult supervision. Accidents have occurred when babies have been left alone with feeding equipment due to the baby falling or if the product has dissembled. Before each use, inspect the product. Throw away at the first sign of damage or weakness. Always check food temperature before feeding. Heating in a microwave oven may produce localised high temperatures. Take extra care when microwave heating. Always stir heated food to ensure even heat distribution and test the temperature before serving. Keep all components not in use out of reach of children.